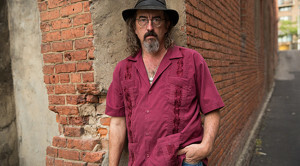 After a five-year gap between albums, veteran singer-songwriter James McMurtry has finally issued a new studio release, Complicated Game. 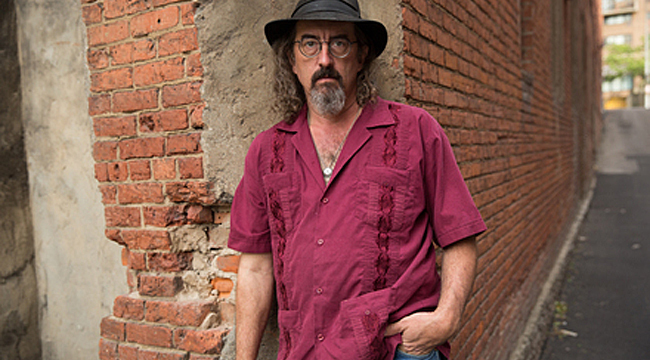 “Back before Napster and Spotify, we toured to promote record sales,” McMurtry says in a press release announcing the album. “Now we make records to promote tour dates.” The album commences with the twangy “Copper Canteen,” a song about hunting season that features McMurtry’s signature sneer and a plodding drumbeat. It sets the tone for the album, yet another solid effort from McMurtry, who made an impressive debut in 1989 with Too Long in the Wasteland, an album produced by John Mellencamp. We phoned McMurtry at his Austin home. Your father gave you your first guitar at age 7. Do you think he expected you’d still be playing it some 40 years later? I don’t know. I think I was about 3. My mother taught me to play when I was about 7. I was beating on that guitar for a while before I knew how to tune it. It made an impression though. Larry had been gone. He was out chasing the rodeo and writing some kind of article, which is ironic as hell cause he hates rodeo but that was the assignment. He was gone for quite some time and I was parked at my grandparents. When he got back, I saw his car pull up and he had that guitar. I think I imprinted on that somehow. Did songwriting come easily to you? I started writing verse in high school. It came pretty easy. I had a good poetry teacher who taught rhyme schemes and meter schemes and all that. It was easy to write a verse but it was hard to write a whole song. You grew up in Virginia. At what point did you move to Arizona? I went to college at University of Arizona. About that time my dad moved back to Texas and we bailed out of Virginia altogether. At school, I think I became a sophomore after about four years. I left in 1984. I used to play at the Saw Mill Café. That was my main gig. They gave me ten bucks and free beer. I thought that was a pretty good deal back then. I don’t think I was really writing yet. I wasn’t playing original material. I was trying to do the most obscure covers I could think of. You just had to do at least one Jimmy Buffett song to please the food and beverage manager to get the gig. In those days, I hung out with the old-time bluegrass crowd. I played backup guitar for those old fiddlers. In the early ‘80s, there were a lot of old guys who could really play the fiddle. Some of them would come from Appalachia and from various parts of the country. They were living in trailer parks. They knew songs that nobody else who was alive knew. They were songs that they passed with them. This is your first new album in six years. Why so long? I just didn’t need to because my tour dates were drawing pretty good. I make most of my money off the road and that draw started to fall off and we needed to have something out there so you write about it so people come to the shows. It must be good to have new material. My band was about to mutiny there. You’ve said your new album is mostly about relationships. Explain that a bit. I try to envision the character who said it. From there, I walk backwards and get the story. They’re not necessarily about you. Mostly not. A lot of my characters wouldn’t agree with me politically but you have to stay in character to get the song written. You also said it’s about the big old world versus the poor little farmer or fisherman. There’s a couple of those. There’s “South Dakota” which about a soldier coming back to his ranch and the ranch getting obliterated. It actually happened in October of 2013. They had an early blizzard that wiped out a lot of ranchers. They brought up cattle from Texas because Texas was in such a horrible drought that they were selling cattle for cheap. The cattle didn’t have winter coats and the October blizzard just obliterated them. My father called up and asked, “Have you heard about the tragedy?” I said, “Which one?” He told me about the blizzard. It struck me as rather odd because he hates cows. He grew up ranching cows. He never did like cows or horses or any of that but he does have an affinity for ranching people. The tragedy really got to him. When I go through local towns, there’s usually a welcome home banner for a service man. I wove some of that in. A lot of people from those towns are in the service because there aren’t that many jobs and there’s not that many places to go. Not that they all are. I have friends who joined the military because they loved it. What inspired “How I’m Gonna Find You Now”? I had a rattle in the dashboard. I just started playing with words and it kind of developed. Do you see your songs being connected with the West? Not really. My songs can be set anywhere. I have eastern stuff. Even on this album you have “Long Island Sound.” And “Copper Canteen” is probably Great Lakes country. There was one called “Rachel’s Song” years ago and the seed for was that I was in the back of someone’s station wagon years ago and I looked out of the window and saw a train coming out of a tunnel and saw the coal covered in snow. It was coming east and I thought, “Great we’re going to get out of school tomorrow.” The weather came from the west and we didn’t get the snow. But years later, I got the song out of it. That was the Point of Rocks Bridge when you cross the Potomac into Maryland. My songs are mostly America but they could be anywhere in America. Were your songs always narratives? I don’t know. I’d have to listen to some of the old stuff but I’d guess it was. That’s how I learned to write. It’s all fiction. I don’t write prose fiction. I write verse fiction. Do you read a lot of fiction and poetry? No. I don’t read much. My father collected books. I had an aversion to books the way he had an aversion to cows. He had a rare bookstore so there were lots of books to be moved and that’s mostly what I did with them. He started in the rare book business in 1970 and he had a store there for about 30 years. That finally closed when the rent got too high. At one point he had a store in Houston and one in Dallas and one in Tucson. It was kind of an empire but then got too expensive so he moved it back to his hometown in North Texas where the real estate was cheap because the oil fields had crashed. He had five buildings full of books and nearly a half million books. He had a big auction and got rid of most of the books. Are you playing lots of new material for your current tour? Mostly new material. We do about a 90-minute set. We mix it up.